Imagine that you are regularly updating your Columnstore Table and it reaches a certain moment when all data inside a compressed Segment is deleted. What happens to the Segment elimination process executed by Query Optimiser ? Will it check on the meta-information level if each of the present rows inside a particular Segment are eliminated and thus reading this segment does not make any sense at all ? Let us kick of with the a simple setup script, that will create a simple table with just 1 column, which shall be defined as an identity by default. As you can see, we have a perfect column clustering on our C1 column, with numbers sequentially occupying their place between 2 compressed Segments. Now we can test our Table by invoking a test Query for determining if Segment Elimination is working as expected in a situation without any deleted rows. Everything looks fine our second Row Group (id =3) was eliminated from the final result, this is exactly what we have expected. Quite visible that in our DeletedBitmap for the first of our Segments we have the very same amount of rows that are located in our first Segment - 1048567. This is means that our first Segment has become practically useless, because it does not contain any data at all (all rows are now deleted). The first question naturally will be what happens with this Segment – and the answer is Nothing. It will stay this way until we shall rebuild our table or partition containing the respective Segment. I will get back to this topic in the end of this blog post. Oh well, we are not very lucky, Query Optimiser has ignored only the second segment while reading the first one, where the value 10 should be contained, but only in this case as we have seen, each value of the Segment has already been marked as deleted in Deleted Bitmap. I imagine that it might be considered quite a waste of time to check deleted bitmaps information and if a Segment has become useless, even though I could argue that such checks by default for DataWarehousing queries are not that expensive, given the nature and specificity of the long running queries, especially because in such environments there are not a big number of them. As an alternative, we need some kind of mechanism which would allow us to delete those Segments without invoking REBUILD functionality, because at the moment we would automatically loose our well prepared Segment Clustering and because it might not make any sense at all. which would analyse such Segments and remove them completely. 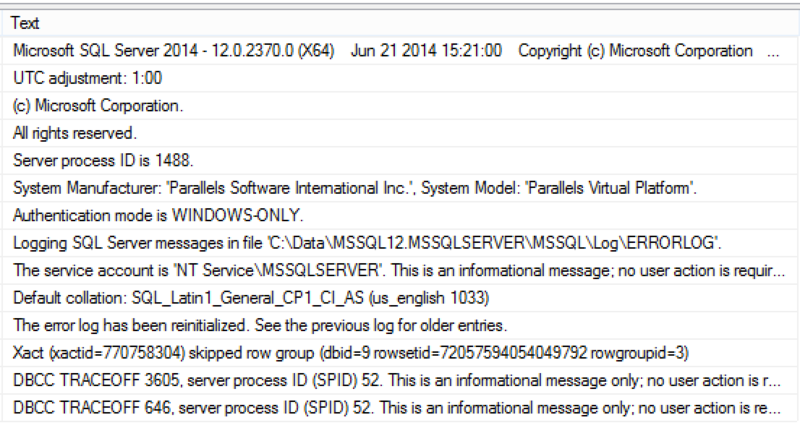 Update on 28th of July 2014: A Connect item has been filed suggesting some improvements into the maintenance procedures for Columnstore Indexes.